This month, we feature Consumer Protection BC, a Clicklaw contributor. 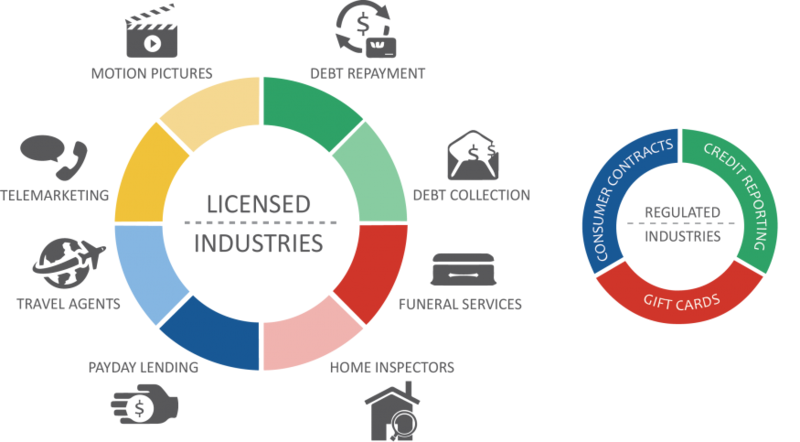 Consumer Protection BC is a provincial regulator that licenses several sectors (see Infographic below) and offers information and referrals to people in BC. Laura Cox is the Manager, Licensing and Information Services at Consumer Protection BC. Her team handles the licensing of all the sectors that Consumer Protection BC oversees, and also offers assistance to consumers. What has surprised you most about working with your organization? I joined our organization in 2012. It is surprising to see how many consumer calls and emails we receive which are outside of our mandate. We work really hard to provide consumers with the best possible referral, but in some cases the referral is to a lawyer, or court. As a regulator, we oversee three different Acts, and many sectors. It was overwhelming to see how much I would need to learn. It seems like that’s a widely held misconception–that you can help with any consumer issue. [I think that because of our name] people assume we can help with any consumer issue, but that’s just not the case. We oversee specific laws and can only help when a potential violation of that law has occurred. This is why my team works so hard to ensure we have the right referrals for consumer issues that fall outside of our mandate. What are some common referrals that you do make? One of our top referrals is to the Vehicle Sales Authority–they oversee the retail sales of vehicles sold through licensed dealerships. We also refer a lot of consumers to the Commission for Complaints for Telecom-television Service (CCTS)–they can help consumers who have an issue with a cell phone, landline, cable, TV, or internet provider. We have a page designated on our new website for our top referrals. To learn more about other agencies who can help consumers within BC visit our referral page here. Do you have any interesting stories of clients you’ve helped in the past year? That’s when Eddy decided to reach out to Consumer Protection BC to see if they could help. It was determined the business didn’t have all the required content in their contracts and Eddy was within his rights to cancel. Consumer Protection BC’s involvement resulted in a full refund. Eddy stresses the importance of practicing due diligence when hiring someone to do work on your house and to make sure you ask around about the company’s reputation. “Normally I am very careful with these kinds of things,” Eddy says. “But sometimes you get caught off guard. I’m thankful things turned out the way they did. That’s a great story. What else do you regulate in addition to consumer contracts? Thank you for sharing with us today, Laura. Last question–what are you most excited about, recently? Our new website launch is really exciting! On top of this we continue to work on an online portal for our licensees. This will allow them to accomplish more online, which will save them time; they will also be able to make changes and renew their licenses really quickly.